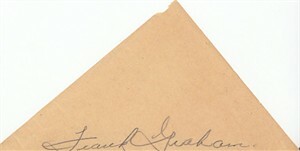 Plain triangular paper autographed in pencil by famed radio announcer and voice actor Frank Graham (committed suicide in 1950). Graham was the voice of the wolf in several Tex Avery cartoons, as well as the mouse in King-Size Canary at Metro-Goldwyn-Mayer. He provided the voices of both the Fox and Crow in the eponymous-named shorts at Columbia. You can also see this story about his suicide. Obtained from the family of a Hollywood housekeeper who cleaned the houses of the rich and famous during the 1940s. Has typical yellowing for its age. With certificate of authenticity from AutographsForSale.com. ONLY ONE AVAILABLE FOR SALE.